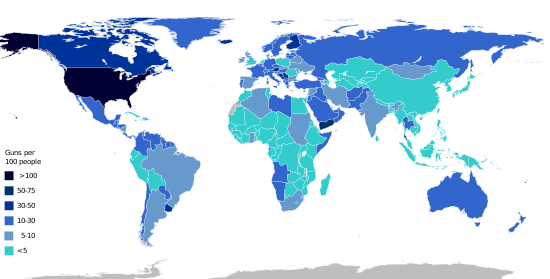 Map of civilian guns per 100 people by country from the Small Arms Survey 2007. This is a list of countries by estimated number of privately-owned guns per 100 persons. The Small Arms Survey 2017  provides estimates of the total number of civilian-owned guns in a country. It then calculates the number per 100 persons. This number for a country does not indicate the percentage of the population that owns guns. All the numbers in the main column of the table below are from the annex table of Small Arms Survey 2017. The briefing paper for it says: "Numbers provided here include all firearms in civilian hands, both licit and illicit." The annex table where all the numbers in the main column come from also includes some subnational areas and territories such as Northern Ireland, Puerto Rico, Scotland, etc.. Sorting: Click the sorting cells below the header cells. "Notes" column links to notes section below the chart. The notes below the table are for additional info. Additional data and alternative rates should be placed there. This way the main column stays in descending order. United Kingdom. [note 1]. Small Arms Survey 2017 does not have a number for the UK. It only provides numbers for these constituent areas: Scotland, Northern Ireland, England and Wales. Ranking by country for civilian-held firearms per 100 population. Small Arms Survey 2017. Some of the notes below refer to a previous version of the table that used numbers from Small Arms Survey 2007. So some of the info below may be out of date. ^ United Kingdom. A GunPolicy.org page has a rate of 5.03 firearms per 100 people in 2017. 3.44 registered plus 1.59 illicit. That totals 5.03 per 100 people. ^ United States. According to the Congressional Research Service, as of 2009[update] there were roughly twice as many guns per capita in the United States as there were in 1968: more than 300 million guns in all. ^ Finland. 1.5 million guns in 2016 in the official registry. ^ Norway. 1.49 million guns in 2017 in the official registry. ^ Sweden. According to the Swedish National Police Agency in 2006, there were a total of 656,000 individuals who had a license for one or more guns; 6.5% of the population. There were 2,032,000 guns or 21 guns per 100 residents. Of the 2,032,000 guns, 959,000 were rifles, 726,000 shotguns, 122,000 combination rifles, 88,000 pistols, 55,000 revolvers, 3,000 automatic guns and 78,000 weapons parts. ^ Germany. The number of legal guns in Germany is about 7 per 100 residents. There are no reliable figures on the number of illegal guns in Germany. The figure of 20 million illicit guns (~24 per 100 residents) that is often cited on the web is an estimate attributed to the GdP, Germany's largest police union. This number is wildly out of range with the UN Office on Drugs and Crime's estimate on illicit guns (10% of the number of legal guns, corresponding to 0.5 million illicit guns or ~0.7 per 100 residents). ^ Venezuela. The number displayed in this table is very likely a significant underestimation. The actual number of guns per 100 persons may vary to more, with an unestimated number of illegal firearms held by civilians, around to 9 to 15 million. ^ Poland. According to police statistics there was 1 gun per 100 people as of 2015. ^ a b c Briefing Paper. Estimating Global Civilian-Held Firearms Numbers. June 2018 by Aaron Karp. Of Small Arms Survey. See box 4 on page 8 for detailed explanation of "Computation methods for civilian firearms holdings". See country table in annex PDF: Civilian Firearms Holdings, 2017. See publications home. ^ Guns in the United Kingdom — Firearms, gun law and gun control. ^ "Guns In America, By The Numbers". National Public Radio. January 5, 2016. ^ "Gun Control Legislation" (PDF). Congressional Research Service. November 14, 2012: 9. ^ "Aseiden määrä Suomessa vähenee – katso, missä ovat maan 1,5 miljoonaa asetta". Yle Uutiset. ^ "Revisjonsrapport for 2017 om politiets behandling av våpensaker" (PDF). Riksrevisjonen. ^ "Arms legislation etc" (PDF) (in Swedish). National Police control ice. 2006-05-31. ^ "Illegale Waffe im Schrank? Zeit, sie loszuwerden Seite 2/2: Die Zahl Illegaler Waffen – nichts als eine Dunkelziffer". ^ "Number of Privately Owned Firearms". ^ P.G. (7 July 2014). "Crime in Venezuela: Guns and money". The Economist. The Economist. Retrieved 4 December 2015. ^ "Liczba osób posiadających pozowlenie na broń - stan na dzień 31 grudnia 2015 r." (in Polish). Police. Retrieved 2016-02-03. GunPolicy.org is hosted by the Sydney School of Public Health, The University of Sydney. Choose any country or region from the sidebar menus for more info.